KITsubs: Kamen Rider Skyrider Episode 16! Everything seemed to be working against this episode's release, but it's finally out! So that screen cap is particularly appropriate. This episode is the begining of the end for part 1. 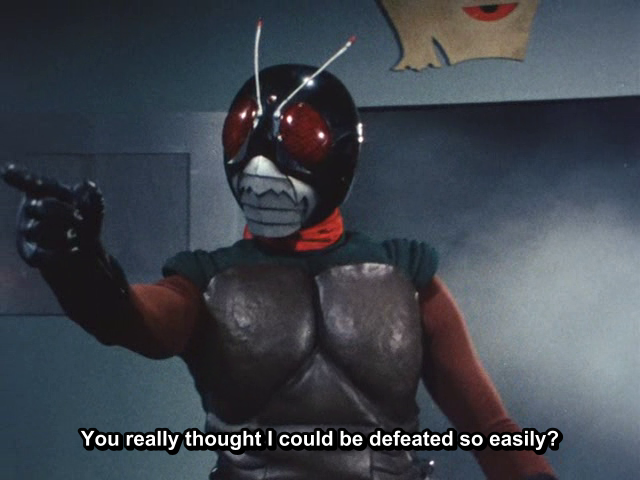 Skyrider faces off against his toughest enemy yet; a monster so strong, that even the Sky Kick is useless against him. And NewShocker's great leader presents General Monster with an ultimatum. And in the end, a mysterious new enemy appears! These next few episodes will see the end of part one, and some exciting surprised for Rider fans. So stick around, because this story might be ending, but Skyrider is just getting started! As with episode 5, this episode had an error in the raw. Visually, you can notice it around 9:53 in the episode. I fixed the corrupted part of the video, allowing the file to be encoded and muxed, but doing so removed a small part of the video. Nothing that you would notice, aside from the pixelation, but it does change the time codes slightly. So that means that this script release will ONLY work with our version of the raw. It might work up until the point that the error happens, but after that it will be out of sync.